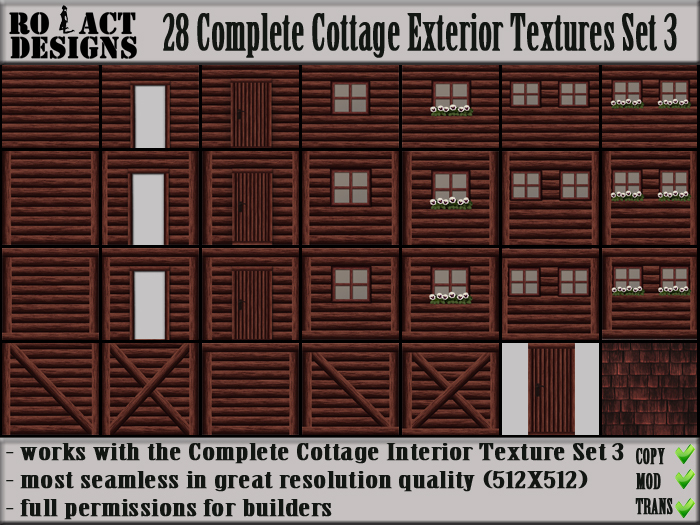 The Complete Cottage Exterior Textures Set 3 are now for sale on both SL Marketplace Shop and the InWorldz Marketplace (InBiz) or from our inworld main stores in Second Life and InWorldz. For more builder's kits please visit the blog HERE. Below you can read more about this texture set and see the advertisement poster. 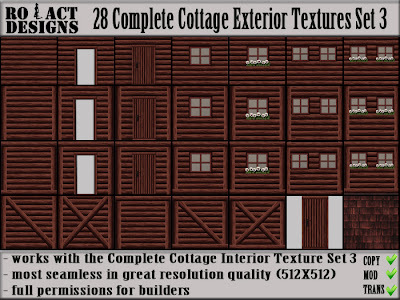 This set is made to work with the Complete Cottage Interior Texture set in case you wish to build a building where avatars can live rather than just decorate a sim. Please see the related textures to find the matching texture set. Violations will be reported to Linden Labs under the American DCMA Copyright Act and this could result in your suspension from Second Life.